Dubai Properties (DP) has started work on the Marasi Business Bay marina, including water features that will be among the highlights of the community. The developer said it has started installing the pontoons at the Marasi Business Bay Promenade. Phase one of the marina will have 157 berths and is expected to be completed in the third quarter. The marina, which will eventually have 800 berths in total, will also be home to the region’s “first purpose-built yachting hub”, according to DP. The Dh1-billion mixed-use Marasi Business Bay development will also feature water homes with pools and floating restaurants along the Dubai Water Canal, and a 12km promenade. “This year you will see a lot of changes in the Marasi project,” said Masood Al Awar, chief officer — commercial of DP, adding that the water homes are on track to be delivered to the marina this year from the manufacturing facility in Finland. Marasi Business Bay is divided into three sections: the park, pier and marina. The marina can accommodate boats of varying sizes with berths ranging from 8m to 35m. The berths will be fitted out with essential facilities for boat owners, including potable water, power supply, drainage and sewage. 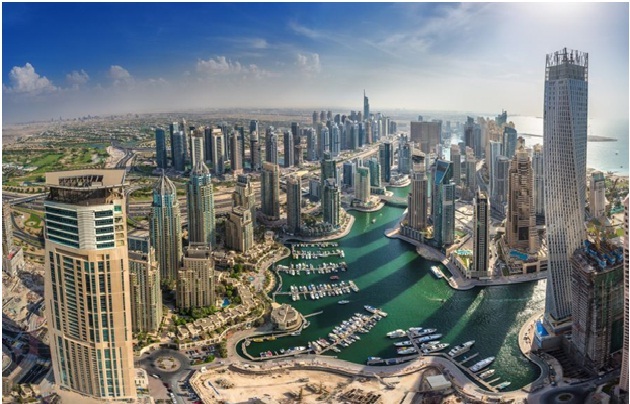 “The new marina at Marasi Business Bay will leverage latest advances in construction and engineering for its on-schedule completion, offering the city a new active urban lifestyle dimension and waterfront destination,” said Abdulla Lahej, Group CEO of DP. Marasi Business Bay is one of the few marinas in the UAE to employ Seaflex technology, an environment-friendly mooring solution. Seaflex provides secure moorings even under severe weather conditions. Residents here will also have retail and food and beverage options at Bay Avenue, Bay Avenue Mall and Bay Square.